Indiana has experienced extreme weather over the last couple of years. Extreme heat, draught, cold, winds, you name it, we’ve dealt with it. Most recently, through June and July, Indiana has experienced record-breaking rainfall and flooding. These weather conditions can make it difficult for our surroundings, but it can also cause a lot of stress on our trees. Urban trees are more susceptible to weather-related injury because of their oftentimes compromised root systems. In forested areas, trees spread their roots out two to three times the length of the tree. This is important because roots are the tree’s way to receieve oxygen from the soil. This provides for a healthy defense system, giving the tree advantages like the ability to draw in moisture during dry spells and secrete fungi- and insect-repelling chemicals. In urban areas, roads and construction oftentimes sever roots or restrict where they can go, leaving the trees in a vulnerable state. Our vulnerable urban trees are especially likely to be harmed by weather-induced stress. 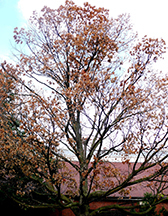 Symptoms like browning of leaves, dying branches and early coloration in the fall are all signs that a tree’s health is declining. Keep an eye on your trees, and if you are concerned, use the Purdue Tree Doctor app​ or submit a sample to the Purdue Plant and Pest Diagnostic Lab as you seek best practices to care and protect your trees.